Most “meh” movies exit your consciousness by the time you’ve tossed the empty popcorn box. Then there are the truly, truly, truly god-awful movies — i.e., the ones that are so spectacularly bad that you’re left with questioning the very existence of the world around you. How on this Earth did this piece of crapola make its way from someone’s brain to the big screen and how many trees had to die in the process? Did the cast and crew working on this project realize this was going to sink faster than the Titanic? 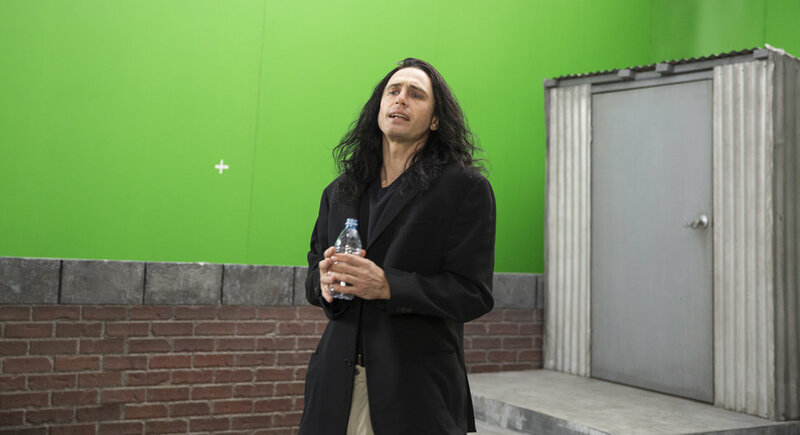 Enter The Disaster Artist. James Franco had these thoughts about a 2003 horror oddity called The Room. (Not be confused with the superb Brie Larson drama Room.) It’s a small-budget project that has reached cult status because of its wooden acting and nonsensical story courtesy of director-writer-producer-star Tommy Wiseau. 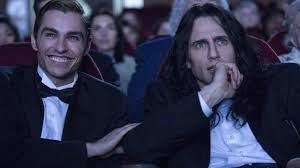 Now Franco has turned his fascination into The Disaster Artist, a goofy and surprisingly joyful inside-Hollywood treat. He directs and stars. Bad has never been so good. Franco takes the Tommy role. With his long stringy black hair, towering frame, hunched shoulders and stilted, pronoun-absent accent, he sorta resembles an Eastern European vampire. As an aspiring actor, he oozes the confidence of James Bond. That’s why a 19-year-old named Greg (James’ younger bro Dave Franco) finds him so appealing. In their San Francisco acting class, Tommy is the only one willing to bare his soul and cry out a scene from A Streetcar Named Desire on stage. Greg has the baby-faced looks but lacks the chops; Tommy has the drive but lacks the self-awareness. He also has the funding — from where or who or what, that’s a mystery. Tommy is also a frustrating enigma of riddles. Together, the unlikely friends uproot to Los Angeles in the late 1990s in hopes of becoming stars. It’s an ambitious plan that goes nowhere. After a particularly stinging rejection (by way of Franco mentor Judd Apatow), the two decide to pull a Ben Affleck and Matt Damon circa 1996. They’ll make their own movie, experience and talent be damned! Tommy plunks down at his typewriter and taps out The Room. He gives himself the lead and offers Greg a major part. Needless to say, The Room is no Good Will Hunting. The plot has something to do with a love gone awry and maybe breast cancer? And as the cameras start to roll, Greg wonders if he’s underestimated Tommy’s, er, eccentricities. Uh-oh. It’s easy to snicker at Tommy’s mistakes throughout the production. Some of them are pure face-palmers, too delicious to spoiler here. Credit Franco for also holding up Tommy as a sympathetic hero. For all his quirks, this is a true artist that believes in himself. Franco will make you guffaw at Tommy and care about him — no insignificant feat considering the way he treats his loyal cast and crew and his best friend. The result is a hysterical and loving tribute sure to generate just as much raucous cheering as one of The Room’s urban midnight screenings. Go figure: Tommy Wiseau gets the last laugh.